Praeclarus Press is committed to offering the best in women's health and supporting healthcare professionals and parents with quality materials. 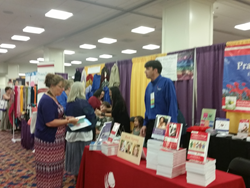 Join us July 20-23, 2016, for the ILCA Conference, "Celebrating Baby Friendly in the Hospital and Beyond: Helping Families Thrive Worldwide" in Chicago, IL., to preview our breastfeeding books and new monographs, as well as learn more about our webinars and other events. Praeclarus Press supports the Baby Friendly Hospital movement and provides resources for both mothers and professionals. Praeclarus Press is committed to providing the latest and most up-to-date resources in the field of lactation and women's health. After acquiring Hale Publishing, Praeclarus Press now has over 80 titles on a variety of aspects of women's health including: breastfeeding, perinatal mental health, childbirth education, doulas, and general women's health. Every year, Praeclarus Press attends the International Lactation Consultant Association's annual conference, which will be held this year from July 20-23, in Chicago, Illinois. On hand will be three authors for book signings, and all of the books will be available for purchase. Kathy Parkes, author of "Perspectives in Lactation: Is Private Practice for Me? "; Dr. Miriam Labbok, author of three books: "Achieving Exclusive Breastfeeding," "It Takes a Village," and her newest title, "Advancing Breastfeeding"; and Marian Tompson, a co-founder of breastfeeding support organization, La Leche League International, and author of "Passionate Journey: My Unexpected Life." The theme of this year's conference is Celebrating Baby Friendly in the Hospital and Beyond: Helping Families Thrive Worldwide. Praeclarus books that support this year's conference theme of creating a baby friendly culture include "The 10th Step and Beyond: Mother Support for Breastfeeding"; "Altering Hospital Maternity Culture: Current Evidence for the Ten Steps to Successful Breastfeeding"; and "Achieving Exclusive Breastfeeding." Please visit the Praeclarus Press webstore for more information about our books and authors, or to sign up for the monthly newsletter and receive the latest details and discounts. Praeclarus Press will be in booth 512 during the ILCA conference. A portion of all purchases made are donated to support global breastfeeding programs aimed at training breastfeeding professionals and helping mothers from all walks of life achieve their breastfeeding goals. Praeclarus Press is a small press founded by Kathleen Kendall-Tackett, Ph.D., IBCLC, FAPA and specializes in women’s health. It features books, webinars, and products that support women's health throughout their lifespan. Based in Amarillo, Texas, the mission of Praeclarus Press is to produce materials that change women’s lives.